The media has picked up on a story of a mother who was refused a car parking voucher when she visited a Tesco store because she had bought only infant formula and not a qualifying product. The reporting of it raises much wider issues about how corporations are mounting an attack on formula regulations as the UK prepares to leave the European Union and conflicts of interest in links between retailers, formula companies and the government. The mother said the Tesco staff made her feel ashamed for buying formula when they told her she could not have the voucher because Tesco “supports breastfeeding” and “cannot endorse formula feeding by rewarding customers” and added that “they do not endorse smoking” so do not issue parking voucher for buying tobacco. The mother posted on Facebook asking Tesco “to give your staff the training they clearly require in order to treat women in this situation with more compassion in future”. Tesco is not reported as apologising or promising to review its parking policy or how it explains it to customers. Instead it has excused staff behaviour by blaming it on formula regulations. These are the Infant Formula and Follow-on Formula Regulations (2007). These UK regulations partially implement international marketing standards that aim to protect breastfeeding AND ensure the proper use of breastmilk substitutes, when these are necessary on the basis of adequate information and through appropriate marketing and distribution. The international standards are the International Code of Marketing of Breastmilk Substitutes and subsequent, relevant Resolutions of the World Health Assembly. The baby food industry and some retailers regularly break them and try to weaken laws giving them force. For more on the regulations see my presentation in Parliament from 17 May 2016: Mothers need support not pressure. I will explore this specific case more below and look at what the law does and does not say. You can also listen to our Policy Director, Patti Rundall, putting it in context on BBC Radio 4 Today Programme and Radio 5 Breakfast Live on Saturday. 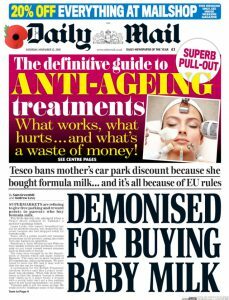 The Daily Mail put the story on the front page (above): “Tesco bans mother’s car park discount because she bought formula milk… and it’s all because of EU rules”. Let’s be clear. A mother who bought products qualifying for a car park voucher would not be banned from receiving the discount because she bought formula milk as well. As the Daily Mail showed, a sign was displayed with products saying formula was excluded from the car park minimum spend. Whether a mother is bottle feeding or breastfeeding, she has to buy qualifying products to the value of the minimum spend to receive a parking discount. She is not banned from receiving this if she buys formula at the same time. However, headlines such as the above have already created the myth that shoppers have to pay for formula separately from other purchases or they will lose their parking discount. “This seems to be bureaucracy run wild” is the justifiable comment on this misunderstanding. More on what products do and do not qualify in Tesco’s scheme is discussed below, but first a look at how Tesco repeatedly flouts the regulations. For example, Tesco has promoted SMA infant formula in its catalogue with the idealising claim that it has the “healthiest nutrients” (left). Baby Milk Action has won cases at the Advertising Standards Authority proving claims that SMA is the best formula made in other advertising are false (all formulas have to comply with legal composition requirements). Promoting formula as the “healthiest” also undermines breastfeeding. Tesco admitted it had been wrong to make the claims, but did not withdraw the catalogues and was not fined by the authorities. 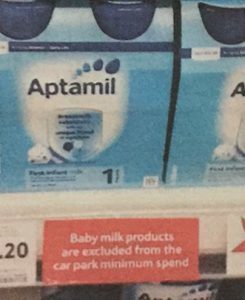 Earlier this year Tesco ran instore clearance promotions for SMA infant formula after Nestlé said that babies fed on it received “protein in excess of requirements”. Tesco did not tell customers why it was trying to clear it from its shelves. When challenged on the illegal nature of the promotion, Tesco said it would stop and claimed it had made a mistake. It said the same in 2015 after running a prohibited infant formula promotion across its chain, even though the materials had been centrally produced. Tesco was cited in Parliament earlier this year for breaking the law with regard to instore promotion of infant formula. The resulting media and political backlash against the regulations prompted by Tesco’s treatment of the mother in this car park case could not have been better for its agenda if it had planned it. Despite flouting the law repeatedly, it claims in the press that it treated the mother like this as “due to UK law we cannot promote baby formula in any way”. Not promoting formula and abiding by the law does not equate to making a mother feel bad about how she feeds her child and we endorse the call for Tesco to retrain staff. The EU directives were developed and supported by the UK government since 1991 and stem from World Health Assembly standards adopted since 1981, also with UK support. These are intended to protect all mothers and babies, whether breastfeeding or bottle feeding. There are provisions on composition and labelling, and they protect the right to accurate information free from commercial pressure. Brexit does present an opportunity to bring the law into line with the World Health Assembly standards to stop misleading marketing – and we will have to campaign so they are not scrapped instead. If the regulations were enforced, formula would be far cheaper for parents who use it because they pay the cost of the advertising and promotion that should not be taking place. How is it that the anti-EU press, the Department of Health and Tesco seem to be aligned in a story attacking the formula marketing law as draconian, when this same law is routinely flouted with regard to instore promotion and advertising with no prosecutions being brought? The Department of Health, which is responsible for the law, works in partnership with Tesco and other supermarkets and formula manufacturers such as Nestlé and Danone on programmes such as Change4Life. The Government also launched a joint report with Nestlé this year on international trade in the food industry. We have long called for it to end these conflicts of interest. What about car parking discounts? Tesco generally offers free parking to all customers for a period of 1 to 5 hours. In this particular store it offers a parking voucher for a car park where you have to pay. This is a common financial incentive to visit a store. Tesco requires a purchase to be made, not just a store visit, something it could review. In some cases this may be because Tesco doesn’t profit from the products (gift cards?). In the case of infant formula Tesco says it is because of the law. 73. Regulation 23 (2) prohibits manufacturers or distributors from providing any gift designed to promote the sale of an infant formula to the general public, pregnant women, mothers, and members of their families. Under Tesco’s current scheme, a parking voucher is an inducement to visit a store and make a purchase. On that basis, infant formula probably should be excluded from the qualifying products. That does not mean, as the Guardian and Daily Mail headlines suggest, that a mother will be banned from receiving a voucher if infant formula is included in the purchase, only that qualifying products also have to be purchased. It was when the mother asked why that she was upset by Tesco’s explanation. We endorse the call for Tesco to retrain staff on how they explain this to customers. Even if it is explained well, some mothers may feel upset to know that infant formula does not qualify for a parking voucher and that they have to buy other products that do qualify. However, the principle that companies should not offer financial inducements for buying formula should not be discarded lightly. In terms of Baby Milk Action’s priorities regarding the marketing regulations, we have far more serious infringements by Tesco and other retailers and manufacturers to campaign about. Click here for our UK Monitoring Report 2016. This also sets out the action the Government should take following Brexit to bring UK law into line with international minimum standards. The reason the law is being attacked at this time may well be because a new enforcement regime has been introduced under which companies will be issued with Improvement Notices with deadlines attached if labels and advertising do not comply with the law. We ran a successful campaign earlier this year to make these legally binding. We are collating examples of marketing that misleads parents to submit to the authorities. You can help support Baby Milk Action’s work by donating, becoming a member or purchasing from our Virtual Shop. Thanks for this. It has been helpful ammunition in a letter to the Department of Health.